Look! It's your favorite Dr. Seuss characters! 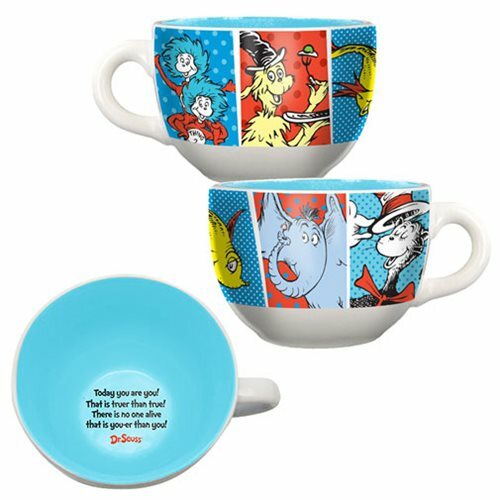 Show your love for the delightful world of Dr. Seuss by adding this 3 1/2-inch tall Dr. Seuss 20 oz. Ceramic Soup Mug to your collection. With bold, bright images of The Cat in the Hat, Horton the Elephant, and more on the outside, and the inspiring words "Today you are you! That is truer than true! There is no one alive that is you-er than you!" on the inside, its mega 20-ounce size is perfect for a serving of soup or your favorite hot beverage, and the handle grip allows for better control. Microwave and dishwasher safe. Ages 14 and up.